excellent review! i own a 232 as well and use it daily for the past two years! what i like the most is the zipperless opening as i can reach in without even opening the flap but still secure enough for things not falling out. although you said the back pocket is shorter but is actually the most convieniece for me to reach tissue paper,umbrella, or a magazine. i hope in the future i can see review on filson vest or wallet…thank you! Thanks for the great feedback! I am glad to hear that you are enjoying your field bag as much as I am. After using the 232 for a few more weeks, I have to agree that the back pocket is much more useable than I initially thought. I still don’t put my iPad in there, but boarding passes, magazines and small books fit great. 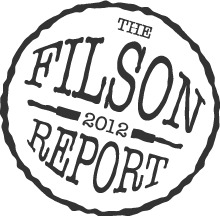 Thank you for visiting the site and stay tuned for more Filson product reviews. Thanks for the review and the beautiful pictures. I think these pictures are some of the only ones on the internet that make the tan look nice (though I’ve never seen them in person). Most of the others make it look like it has a mustard/yellowish hue whereas yours actually look like tan. I’ll be purchasing a 232 tomorrow which I am very excited about. Again, thanks Charles! That is great news! Congratulations on the 232 Field Bag…I am glad that my pictures could help you make a final decision. The classic tan is beautiful in person and definitely changes character in different lighting situations. Check back in in a couple weeks and let me know your thoughts! I’m think now that since the 232 and the 256 are the same price I’m considering getting the 256 instead. What do you think would be better as an everyday carry and which one has better internal organization? I think that is the correct decision. If you can only have one Filson bag, the 256 offers much better organization for everyday carry and is much more versatile. The 232 is very stylish, but less useable for day-to-day use, especially for books, laptops, etc. Go for the 256…you won’t regret it! That’s disappointing to hear about the Macbook Air 13″ not fitting. I have not seen a 256 in person, but I liked the sizing on the 232. I’m a shorter guy at 5’4″ and I’m worried the 256 is going to emphasize that. All I typically carry are the macbook, notepad, and smaller things (pens, etc). Thanks for your comment, Manny. I agree it is disappointing…I think you could force the MBA 13″ in at an angle if the bag was empty, but practically speaking it wouldn’t be a very workable solution. The 256 would be your best choice, especially with the interior organization. Hope this helps. Thank you for this blog. This is simply the best source on Filson bags on the net. Currently looking at the 257 in tan (first Filson, has to be tan), I will be looking at 232 soon, I do quite love backpacks, just shouldn’t have it for the office. Weekend adventures and light hikes? 232 it is. Thanks so much for the kind works…I truly appreciate it. The 232 and 256/257 would make a killer combo. Keep in touch and send some pics of your bags when they arrive. I’ve got a fantastic medium field bag in tan that I’m looking to sell (replaced by an original briefcase for more storage capacity). I say fantastic because I bought the bag used off Craigslist (not a factory second) and it came with an amazing amount of character built into it already. When I took it to the Filson store in Portland (I live in Vancouver, Canada), the store owner assessed my bag to be around 20-30 years old as the twill was slightly different back then (he said). If you’d like, I can send photos over to you to check out and maybe even share on your website. Would you be able to help me find a new home for my bag; preferably someone who’d appreciate and love a well made and well worn Filson medium field bag? Thanks Charles. After reading your review, I got a medium field bag for my camera and getting around town. I tend to carry pretty bare bones but occasionally need to carry my 15″ retina MBP. Surprisingly when completely empty the bag can fit my 15″ retina MBP. I will have to see if the laptop can still fit after placing my camera and notepad. I just discovered your site and really enjoy it. I have a ton of Filson gear among which are 6 bags including the 232 (10+yrs.) and 257 (6+ yrs.). I’d choose the 257 for work use as it offers better organization options. I use the 232 less since getting the rucksack (10+yrs. ), which rides closer to the body and holds more stuff. My wife commandeered the 232 a couple of years ago and it’s looks great on her. I’ll post some pics if I can figure out how. Hello, just found this site and review and wanted to comment on the great write up. I did however want to mention something that I found different than your review – I have a 232 in the Otter Green and I’m very easily able to fit in my 13″ MacBook Pro as well as a few textbooks for class! I just wanted to point this out so others don’t get discouraged in purchasing this bag – it’s absolutely fantastic! Thanks again for the great review! Thanks for the feedback! Perhaps I didn’t break the bag in enough, and also I should clarify…it is possible to carry a MBP, but I just didn’t find it very convenient to carry my laptop inside. I am used the easy in/out of the 256 Original Briefcase, which works better for me. Have a great weekend and enjoy that 232! I ordered the field bag based on this review and it’s been great so far. However, I too was very comfortably able to fit the MBP 13 inch along with other things. Thanks for your comment! Another reader also pointed out that he was able to fit a 13 MBP 13 into the bag. I found that it required a bit of manipulation and due to the open concept of the bag it is less than ideal if I was looking for a bag to carry a laptop on a daily basis. In a pinch, it would certainly work, but for my $$ I would lean toward a 256 if transporting my MBP was a priority. Could you give a size comparison between the briefcase and medium field bag? Are they close? How do they feel when carried vs. each other? Is comfort the same when carried? 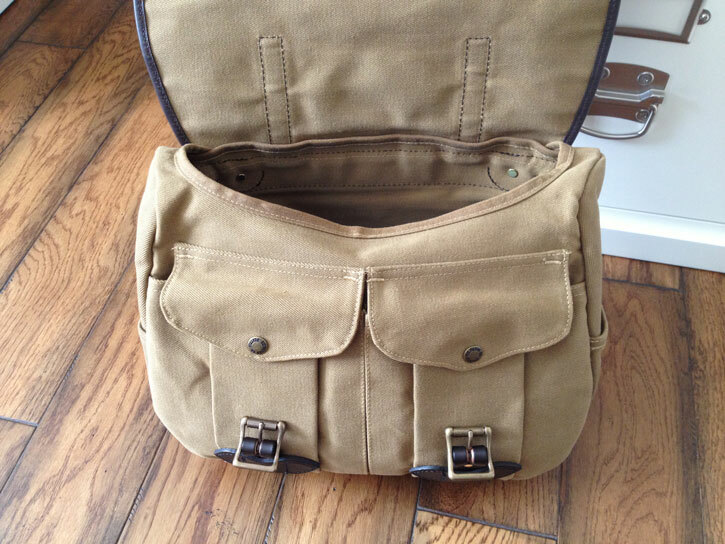 I only found the review of the field bag… Maybe I’m missing something? This is made also in wool. What are the differences? Is it as durable? Waterproof? How is the rigidity of the wool? I apologize that it took me so long to answer your question…I was out of town during the holidays putting my Filson bags through their paces. 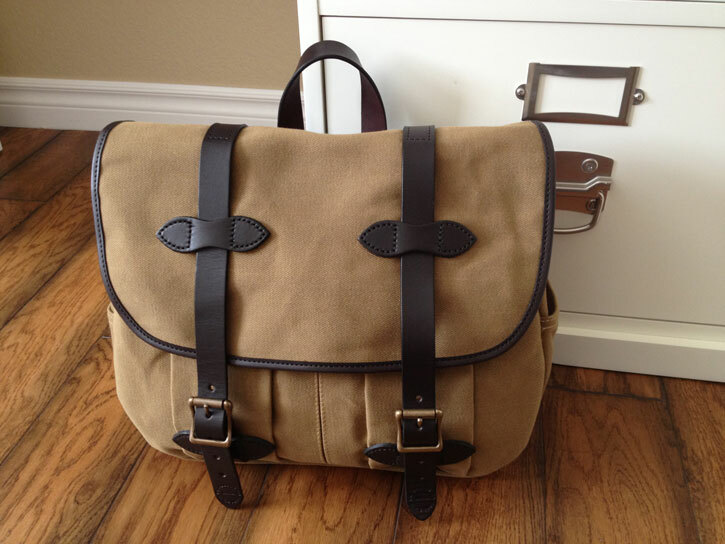 Congratulations on your new Filson Medium Field bag! You made a great choice as a daily-use bag that can take pretty much anything you can throw at it. I think you will love the Otter Green in that style. To answer your question, the wool is not as rugged or durable as the classic twill. It is “dressier” looking and comes in unique colors and patterns, but for hard, daily use there is no substitute for the twill. 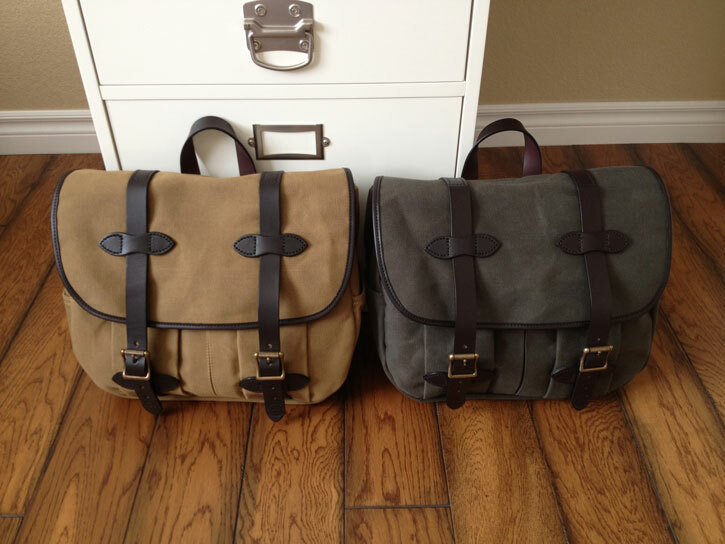 I have the medium field bag in twill (now 70232) and the briefcase computer bag (now 70257). I used both for work but found the field bag opening either to small or, at a minimum, inconvenient as was the full flap top w/two straps. Also, my stuff just sort of collected in the bottom. The briefcase is more organized and keeps things vertical. Now I stick with the briefcase. My wife made off with my field bag-makes a cool, stylish bag. I bet the wool field bag’s really nice. Enjoy. I agree with you 100%…thanks, Mark! Thanks for the review. After a long consideration, I finally bought the medium field bag to use as a daily briefcase / camera bag / carry-on / etc. To confirm, but not to contradict, a Macbook Air 13″ does fit in the bag. It also fits in the back slash pocket with a couple of inches exposed. And, it’s not the best bag for carrying it. One question/complaint – I’ve head the side pockets described as being able to carry a water bottle, but I don’t see how. They’re really too small for that. If anyone has a bottle they regularly use that works, I’d like to hear about it. Beautiful bag, beautiful quality, great initial review and useful comment thread. Cheers. Thanks for your comment and the great feedback! I am glad that you are enjoying your medium Field Bag. It is a very versatile piece. Hi all, please could someone who uses a 232 and a 13″MBP please send me a few pictures of it in use? I really like the 232 over the 240. I have the 256 and 258, but they aren’t very “messenger-y”….if you know what I mean? I basically carry the above mentioned laptop, an A5 Filofax, a small kit with some meds and a Leatherman and another with chargers, cables, etc, a file or two (maybe 10-15 pages) and a Sony RX100. Would the MBP still fit, and if so, how is it to pull out/push in? Apologies for the questions, but I need to pick it up today. November 6, 2014 - 10:44 pm Rudy M.
I just stumbled onto this site. Nice review. I have had the medium field bag for a long time–maybe 15 years or more. It has lots of character now and a bit of wear on the bottom. I use it mostly on car trips and for short trips while traditional bow and arrow hunting. This bag has seen hard use and I have re-applied the treatment a couple times to it, and I stay up on the leather treatment. I think newer ones have a padded strap pad. It will hold a full size DSLR with 70-200 f2.8 no problem, and still have room for a flash and a 30mm f1.4. I have a 13″ MBP and it is a very hard fit–not practical. I use the larger, more organized computer briefcase instead–I have had that for about 15 years as well. Lots of room for extra stuff on the inside and the organizers are nice. Lots of room for extra files on the inside and outside, but the dividers have not bottoms and sometimes cords get tangled. I put some foam in the bottom of the computer slot for a bit of extra padding incase I set it down hard. I wish the end pockets on both bags were taller with bellows and had flaps with snaps. I should have bought the all leather Filson brief case 20 years ago when it was around $395.00 or so–now it is over $800.00! Very classy though and it will last several lifetimes if the leather is properly cared for. Thank you for your comment and sharing such great info…I am sure it will help many readers narrow down their options! 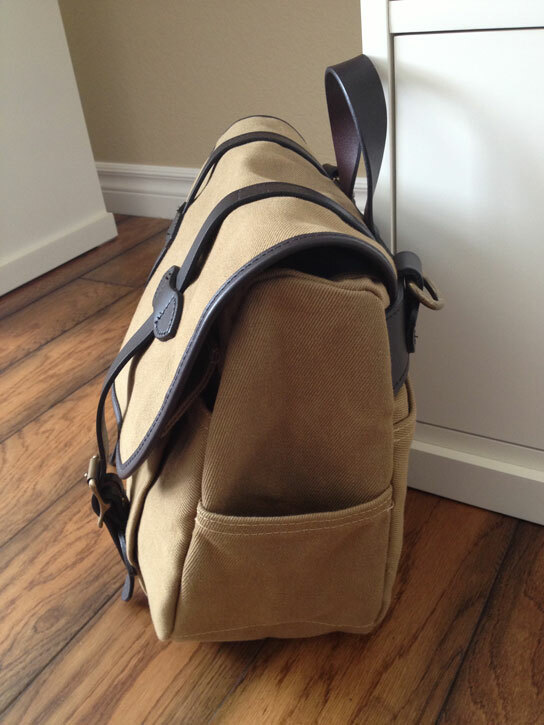 Do you know if Filson has discontinued this bag? All colors are out of stock on Filson.com. 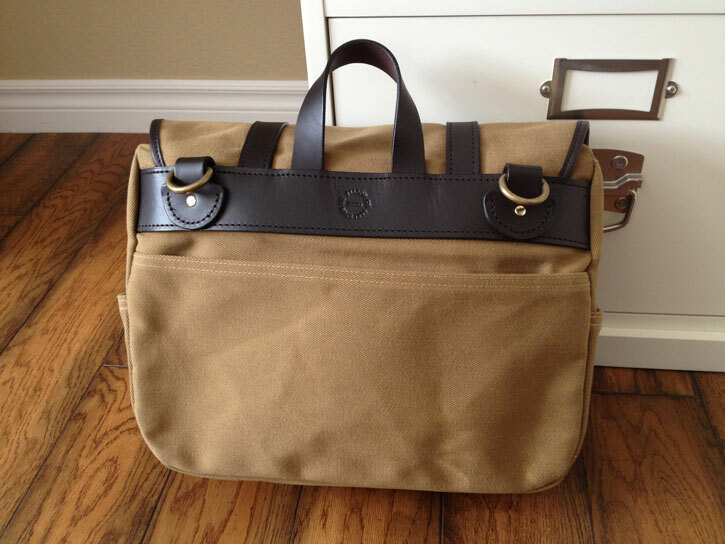 Yes…Filson appears to have discontinued the 232 Field Bag. It was a very popular bag, so my guess would be that a revised version would be released in the future. Thanks for your comment! Do you have a color preference for the 232 medium field bag in terms of aging and fading? 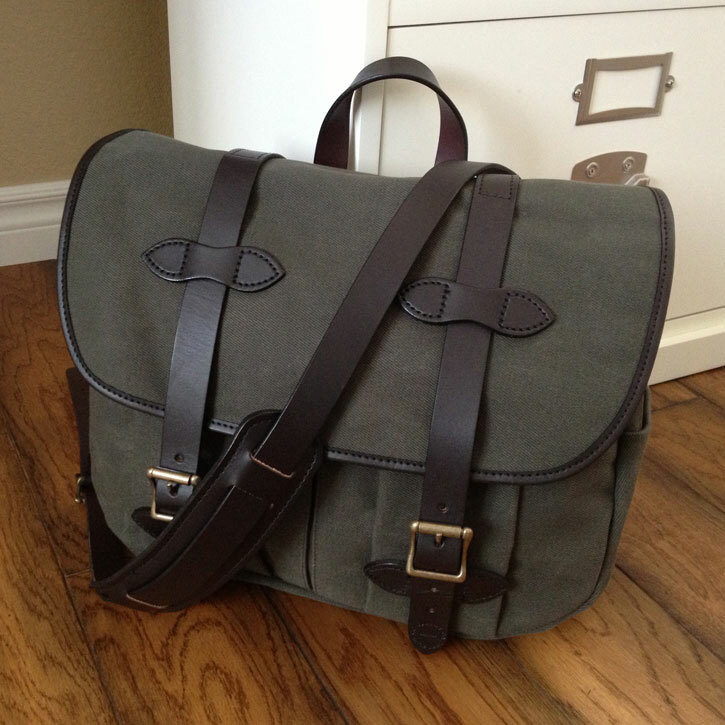 My favorite Filson color is Otter green so I tend to prefer that regardless of which style bag I am considering. It tends to fade over time and hides dirt a bit better than the tan. In addition, it has less contrast between the strap and the tin cloth so I find that it fits into business environments a bit better.